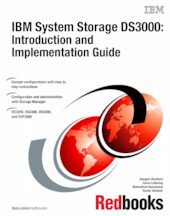 This IBM® Redbooks® publication introduces the IBM System Storage™ DS3000, providing an overview of its design and specifications, and describing in detail how to set up, configure, and administer it. Since the DS3000 has different disk attachment options, we describe these different methods, including SAS and Fibre Channel. This edition covers updates and additional functions available with the DS3000 Storage Manager Version 10.35 (firmware level 7.35). You learn how to install the DS3000 Storage Manager, and how to use its GUI and command-line options. We cover quick setup of the DS3000: creating arrays and logical drives and making the storage available to a hosts. You will also find advanced management tasks, including setting up and managing FlashCopy® and Volume Copy. Finally, we provide several configuration scenarios. The scenarios describe different methods for attaching various DS3000 models under Windows® and Linux® , including clustered and boot-from-SAN environments. These examples include step by step instructions using both the GUI as well as command-line scripts. This book is intended for customers, IBM Business Partners, and IBM technical professionals who want to learn more about the capabilities and advanced functions of the DS3000 Series of storage servers with Storage Manager Software. It also targets those who have a DS3000 storage system and need detailed advice on how to configure and manage it.